1. AASTMT Sheraton Campus Student Zainab Abdel Rahim Sayed Ahmed - Second place in the field of Fine Arts (Photography). 2. AASTMT Sheraton Campus Student Wa`ed Saber Ahmed - Third place in the field of Fine Arts (Photography). 3. "Image Processing Devices" Project won the second place in the competition of scientific innovations (Engineering Innovations) three projects, namely the design of a device that recognizes the best glasses suitable for the face, water scooter and 3D Scanner, by AASTMT Alexandria Campus Students: Salem Nabil Abu Bakr - Mohamed Ibrahim Naga - Ahmed Ihab Darwish - Refaat Abdel Halim Bassiouny - Nadi Abdel Moneim Ahmed. 4. 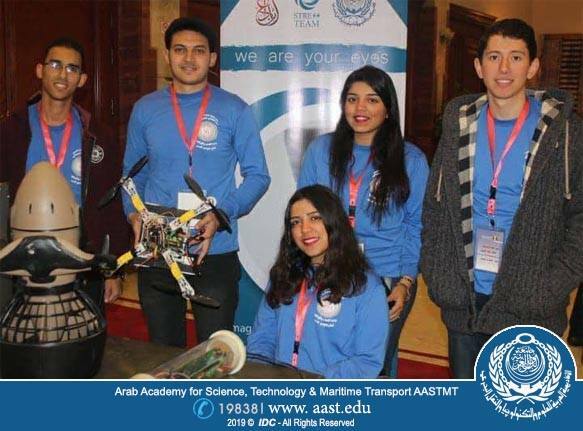 "Chimera" Project won the second place in the competition of scientific innovations (Entrepreneurship Competition) the project is 3D Printers and provide 3D scanning services for the Egyptian market in several fields such as engineering, medicine and industry, by AASTMT Alexandria Campus Students: Mohamed Ali Ahmed - Mohamed Ibrahim Ashraf.